You catch yourself daydreaming of warm tropical beaches and chilled Margaritas knowing that an abundance of sunshine requires no shoveling. Who could possibly blame you for seeking an escape? For three or four months each year beginning in about November, thousands of cold-weather escapees follow their instincts, flying south for the winter. And it’s not only ducks, geese, and other birds that do this. Many humans make the trip too, and a fair number of them choose Mexico’s tropical Riviera Maya for the perfect wintertime getaway. Along the Yucatán Peninsula’s eastern coastline, this spectacular 80-mile stretch of palm-peppered, sparkling white sand, gently bathed by warm Caribbean waters, is the number one escape destination in all the Caribbean. Flying from any major hub to the modern, bustling tourist Mecca of Cancún (the northern gateway of the Riviera Maya) is often a quick and inexpensive flight. It’s not unusual to find roundtrip airfare in the range of $300 to $450. With a population of some 650,000 residents, this modern city is not only the Caribbean’s number one vacation destination, but is also home to a significant number of year-round expats who have made Cancún their permanent residence. Riviera Maya’s snowbirds think of this area as their “other home.” Their routine consists of making new friends, reuniting with old friends, enjoying parties and hundreds of wonderful restaurants, spending hours on sundrenched beaches, or lazing around the pool. The area’s rich cultural and archeological history permits swimming in underground cenotes (sinkholes) and visiting ancient Maya ruins, all close by. Boredom is never a problem. With fishing, playing golf, sampling tequila, and determining who makes the best guacamole, days and nights offer many opportunities for recreation on the Riviera Maya. Shopping needs are easily handled with numerous large malls and major brands well represented. Super markets offer an expansive selection of food, much the same as you would find in large cities in the U.S. Fruit and vegetables can be purchased at significant savings, however, by visiting one of the open markets in the centro (town center). Cancún’s Mercado #28 is a well-known example with a large section devoted to fresh food. You can also visit one of the local butcher shops or fish vendors for their offerings, where prices are less than those in large super markets. Sam’s Club, Costco, and Walmart all have several locations, and major restaurant chains such as Applebee’s, Friday’s, Ruth’s Chris, and Outback compete with wonderful local restaurants. Snowbirds in Cancún can rent a small, furnished apartment or condo, off the beach, from around $750 per month, with a 4- to 6-month lease. Monthly rent on small beachfront units can run upwards of $1,200 for the same period. From Cancún, a 30-minute drive south will bring you to the Puerto Morelos exit. This once-sleepy and charming little fishing village has now been discovered with new construction of condos and housing evident throughout the tiny town. It is still quite charming—if a bit more expensive than in years past. Seasonal rentals can also be found here and those closest to the beach, naturally, cost more. Expect to pay from $900 to $1,500 per month for rentals on the beach side of the highway. Puerto Morelos now boasts several medical clinics and two modern grocery markets on the main highway, just outside the village. For major shopping and any significant medical needs, expect to go to either Cancún to the north or Playa del Carmen to the south. The city of Playa del Carmen is the next large population center south of Puerto Morelos. With a population now estimated to be around 250,000, this area is thought to be the fastest growing area in all of Mexico (some say all of Latin America). Construction seems to be happening every day. Playa has developed from a small town with a funky beach vibe into a modern, vibrant, upscale landscape, ripe for real estate developers and investors. With its artsy, bohemian ambiance centered around the famed Quinta Avenida (5th Avenue) walkable mall area, the emergence of Playa del Carmen as “the place to be” is underway. Snowbirds in Playa del Carmen enjoy hundreds of restaurants from authentic family-owned taco stands to glamorous rooms with French cuisine. Brand-names such as Ultrafemme and Clinique have a presence there, as do big-box retailers like Walmart, Sam’s Club, and Costco. Several modern hospitals provide excellent care. International airport access is through Cancún to the north or the Island of Cozumel, just offshore. Playa del Carmen lacks the resort-infused beachfront of Cancún and offers a slightly less tourist feel. Numerous galleries, jewelers, and artisan shops line the Quinta Avenida pedestrian mall, with ample offerings to put a serious dent in your bank account. There are many choices for housing ranging from small four-unit buildings in the heart of the city, to the large Playacar residential developments with numerous choices of condos and single-family housing. Rental prices range from about $800 per month for a downtown studio, to $2,500 or more for a larger, two-bedroom unit in Playacar. Continuing south from Playa del Carmen, along the modern paved highway, you’ll discover the villages of Akumal with its turtle-filled bay, and Tulúm with its ancient Maya ruins. For those seeking a respite from crowds and heavy traffic, either Tulúm or Akumal allow enough room to breathe and stretch one’s wounded psyche. 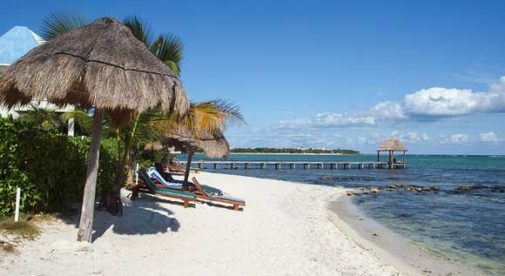 Both Tulúm and Akumal fall into the category of comfortable beach life without the frills. For those seeking an island experience, The Riviera Maya also provides two beautiful examples; Isla Mujeres, and the better-known Cozumel. Don’t imagine a remote, Gilligan-like experience, though. These islands are complete with taxis, nightlife, and all the modern conveniences. Rental prices match those found on the mainland. The entire Riviera Maya provides average temperatures in the 80s F and access to warm, clear tropical waters teeming with life. The offshore, Mesoamerican Reef is the second largest in the world and provides astounding diving and snorkeling opportunities. For those who love to fish, these waters won’t disappoint either. With ample sunshine, warm temperatures, access to the sparkling clear waters of the Caribbean Sea, tons of restaurants, good medical care, quick and inexpensive travel times, and a cost of living that fits almost any budget, Mexico’s Riviera Maya deserves a look from prospective snowbirds.